Not too long ago we announced the launch of OperationUpCycle.org, an organization focused on converting school buses that use old diesel engines to run on brand new CNG engines makes buses healthier and last longer; it also reduces dependence on foreign oil and creates jobs in green manufacturing, maintenance, and operation. As Overit Media took the branding reigns on the Operation UpCycle project, we found it necessary to look at ancillary, yet important, partners of the new brand. Being certain that the strength of the overall brand and website we were strategizing would not be diminished by a partner website that was not complimentary was a priority. The new brand’s strength had to reach beyond its borders of website, print materials and marketing, and with that in mind, Overit Media took on the responsibility of planning, redesigning and redeveloping a website for one if Operation UpCycle’s main partners. Just as a brand is more than a color scheme and a logo, the ecosystem of connections to the brand can play strongly into how a brand is perceived. Brand partners are certainly part of this perception equation. NGV Fleet came into this particular equation as a small, templated website that was not complimentary to the strength and impact of the new website and brand built around the concept of Operation UpCycle. And while NGV Fleet as an entity didn’t have negative connotations or connections to its own brand and image, it was important for us to improve their web presence so as to build more brand strength into Operation UpCycle while taking NGV Fleet’s brand to new levels. The newly launched site features a clean, crisp interface and simple navigation with content on the other end that speaks clearly and concisely to the very specific audience of the website. Each page, too, features a strong headline that speaks directly to the visitor in regards to the content on each page, again clarity and set expectations are created and met. 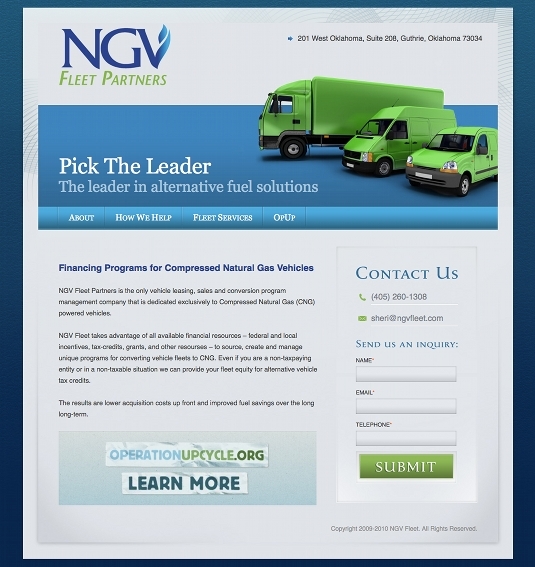 While web-based inquiries were important to ngvfleet.com, we made the interface (along with easy to access contact information) easy to find and even easier to manage by having as few fields as possible while giving NGV Fleet the most important information needed for lead-generation. Additionally, a clear connection to Operation UpCycle is present, giving a clear cross-marketing, cross-branding opportunity for both. Branding and websites in general are products of a much larger ecosystem and that very ecosystem should be taken into consideration for the strength of your brand. If we’re talking strictly websites, it should be understood that the perception of your brand goes beyond the borders of your website itself. That’s part of the reason why it’s called the World Wide WEB — sites, pages, people and brands are interconnected for better or worse.